My students threw a party for me yesterday, my last day for awhile. I have repeatedly said that I will return in January, but maybe they don’t believe it. I’m not sure. The party was great fun and I was pretty moved. I might have been even more emotional if they had managed to keep it a secret, but they kept giddily mentioning it to me last week. They had taken up a collection and bought a huge cake with my name on it. They also gave me some really hideous rose motif pajamas (with booties, a scarf and a hat to match) and this purple fake velvet robe with leopard print trim. We did some dancing to TV videos and took a bunch of pictures. Sunday was entirely consumed with 2 very different meals. We had lunch at the home of one of my students, Asmahan. She and her family live in Khalde, south of Beirut. Her husband and kids came and collected me and Ethan from in front of AUB, and we had a traditional Levantine meal. The kids are really fun and speak quite a bit of English. Asmahan gave us all kinds of small presents, mostly knick knacks from around the house. This is always a tough situation, because one absolutely cannot refuse such things, but it is always too much, especially from people who can’t afford much. You always have to be very careful not to compliment different items too much, because they will invariably be given to you as gifts. That night, we went to a (belated) Thanksgiving dinner. We thought we had missed our chance, but our friend, Mike, invited us to dinner at his parents’ home. We had turkey and all of the usual, with the parents and a few other friends. There was a lot of political discussion, stories about living here during the war, etc. Both of Mike’s parents are professors at AUB and have a lot to say about Lebanon’s past, present, and future. Tonight we are going for our last dinner with Carrie and some other friends. It’s our last evening in Beirut with Carrie- she will be leaving for good next week, in time to make it to our wedding in TX. It’s been a bit of a scramble to get things done in preparation to come to the States, but we are almost there. Ethan is convinced that I am going to experience some sort of culture shock after having been gone for 6 months, but I don’t think that I will. I don’t think it is different enough here. It’s very westernized and we are able to speak English nearly exclusively. The one thing I am slightly nervous about is getting hit by a car. If you want to cross the street in Beirut, you pretty much just walk into oncoming traffic, forcing the cars to stop. You could wait around all day, otherwise. The crosswalks in NYC are going to be a little tricky for me at first. 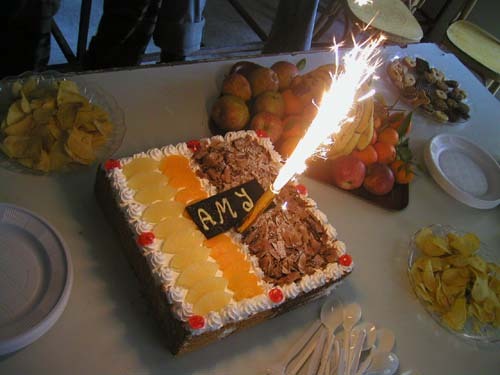 You are currently browsing the Amy’s Journal weblog archives for November, 2005.